That’s right, I’ve taken a road trip with the Bobcats to the 2011 MAC Championship which will be coming to you from Ford Field in Detroit. The Bobcats will be taking on the defending West Champion Northern Illinois Huskies. Keep it here for updates throughout the game. 5:20- No matter who wins tonight, one team’s streak MAC Championship futility will come to an end. NIU hasn’t won the conference since 1983, Ohio since 1968. 5:26- First people to the seating bowl? The Marching 110 of course! 5:38- The main matchup tonight will be Huskie quarterback Chandler Harnish vs. the Bobcat defense. He has single-handedly taken over games for NIU, averaging over 100 yards rushing and 200 yards passing per game. 5:41- Going down to the field. 6:25- Well, that was surreal. 6:32- Both teams have been receiving late season love in the polls. NIU earned 19 points in last week’s USA Today Coaches’ Poll (ranked 30th) while Ohio received eight (ranked 32nd). 6:38- The Marching 110 takes the field to do a pre-game set. 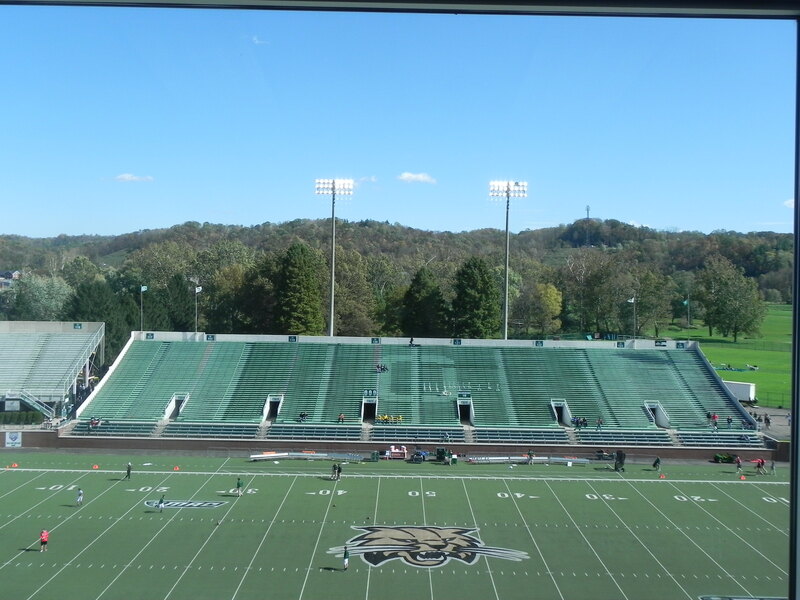 Ohio will serve as the away team. 6:45- With the way the NIU band entered, we may just have two of the most unique bands I’ve seen playing tonight. 6:48- Just how good is Chandler Harnish on the ground? He ranks 15th in the nation in rushing yards per game. Remember he’s a quarterback!! 6:54- An Ohio win tonight would give them 10 wins, something they have also not accomplished since 1968. 6:55- For those curious, the game is airing on ESPN2. 6:58- Ohio is going to try and emulate Eastern Michigan’s game plan which consists of run, run, and run some more on offense to keep the ball away from NIU. 7:01- Kickoff, Ohio receives as Donte Harden returns the kick to the Ohio 26. 7:03- So about those jitters? Tettleton’s first pass of the game finds LaVonn Brazill for a 44 yard gain. Ohio down to the NIU 30. 7:06- The feelings are short-lived as Tettleton forces a pass into double coverage in the end zone two plays later by Jhony Faustin. 7:06- Two plays later, Noah Keller takes the ball right back for the Bobcats on a tipped pass and returns it all the way to the NIU 19. Bobcats couldn’t have asked for a bigger break. 7:11- Ohio can’t muster anything on offense and must settle for a 30-yard Matt Weller field goal. OU has had a problem capitalizing on red zone opportunities as of late. 7:12- That Harnish pick on the Huskies first drive was his first since October 15. Just his 5th total of the year. 7:18- Harnish’s first big run of the night get’s negated by a clipping penalty. Huskies can’t convert a 3rd and 16 and gives the ball back to Ohio. Bobcats have a chance to inflict some real damage here. 7;25- That’s how you finish a drive. An 8-play 70-yard drive capped with the ol’ Phil Bates reverse pass to Donte Foster. Ohio pulling out every trick in the book. 10-0 Bobcats with 4:05 left in the first quarter. 7:31- Huskies finally get a first down, but Ohio puts the clamps down. Incredible that they have held NIU to -2 yards passing and just 33 total yards as the first quarter winds down. 7:35- LaVon Brazill with another crazy one-handed catch to extend the drive. -NIU has -2 yards passing. -I’ll repeat that again, after one quarter NIU has -2 yards passing. 33 total. -Tettleton is 7-of-9 for 103 yards with that one interception the only chink in the armor. -Ohio is throwing the ball laterally more than I’ve seen all year. They are getting opportunities deep on the secondary with ease. -This is not a time for Ohio to take their foot off the gas. NIU can get back in this game just as easily. 7:46- Bobcats driving yet again. Haven’t seen them move the ball at will like this since the Marshall game. 7:49- This could be a huge stop for NIU as Ohio is able to get down to the 5-yard line before stalling. A Weller chip shot makes it 13-0 with 11:03 remaining in the first half. It may not be in the Bobcats’ best interest to leave this game in the defense’s hands. 7:53- Return specialist Tommylee Lewis fumbles on the ensuing kickoff after being hit by kicker Matt Weller. Ohio has a chance to make this a laugher before half time. 7:56- Tettleton makes another bad decision forcing a throw while getting hit that gets picked by Dechane Durante. 8:01- NIU gets the spark they need as Harnish finds Nathan Palmer on a bomb that puts the Huskies at the Ohio 18. Huskies now inside the Bobcat 5. 8:04-Ohio gets yet another huge play as Noah Keller forces a fumble that is snatched up by Hasting. Survives the dreaded “tuck rule” review. Nothing could be going more wrong for NIU who will have to dig deep on defense yet again. 8:13- Ohio has driven down to the NIU 34 but call a time out when faced with a big 3rd-and-3. This could be a huge momentum swing. 8:18- Mario Dovell gets divine intervention from the replay booth as a questionable call keeps Ohio’s drive alive. Tettleton gallops for an 18-yard touchdown the next play. 20-0 Ohio with 2:35 left in the first half. 8:21- This is just getting uglier and uglier for NIU. They nearly lose the ball again on a fumble in their own territory. Mental struggles starting to creep in. -The Huskies have been shut out at half time for the first time in 25 games. -The yardage numbers are gruesome. Ohio with 302, NIU with 92. – Even with Ohio topping 200 passing yards in the first half, I think they turn to the rushing game more in the 2nd. Harden has had some nice holes and is averaging 4.9 yards per carry. -Chandler Harnish is 3-0f-7 for 35 yards. If it were not for his 37-yard completion late in the half, he would still be in the red. -The always important time of possession battle favoring Ohio 19:21 to 10:39. -LaVon Brazill has 7 receptions for 118 yards. Hello MVP. 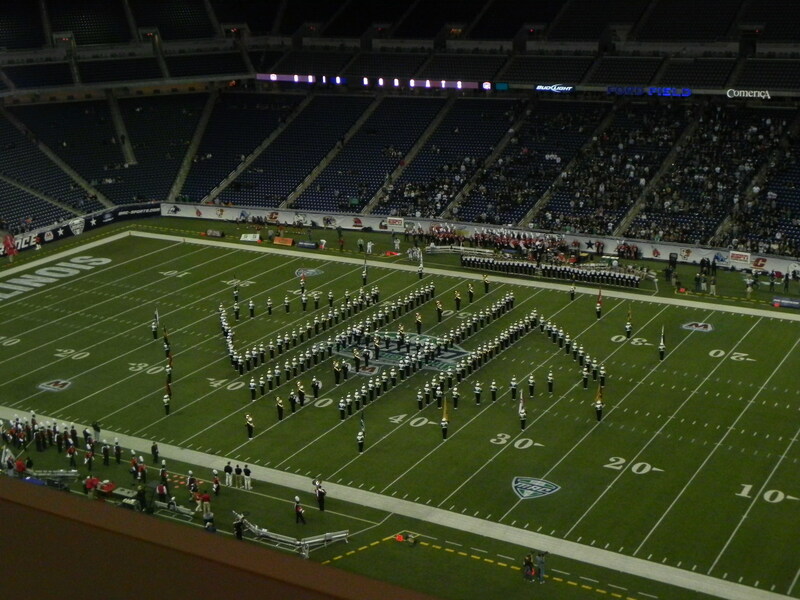 -NIU looks like a D-6 high school band compared to the Marching 110. 8:50- NIU blows their chance to get back into the game with yet another fumble that gets recovered by Josh Kristoff. A scrum in the pile results in Cory Hastings getting ejected for punching an NIU player. Huskies have now committed four turnovers so far tonight, a new season high. 8:56- Ohio goes three-and-out and Paul Hershey punts for the first time tonight. 8:59- Announced attendance is 13,052. That is much lower than the season average for both teams. 9:07- NIU finally puts together a scoring drive. 10 plays 78 yards in 3:52 makes it a 20-7 game. Ohio has to be careful as there is still 6:19 left in the third. 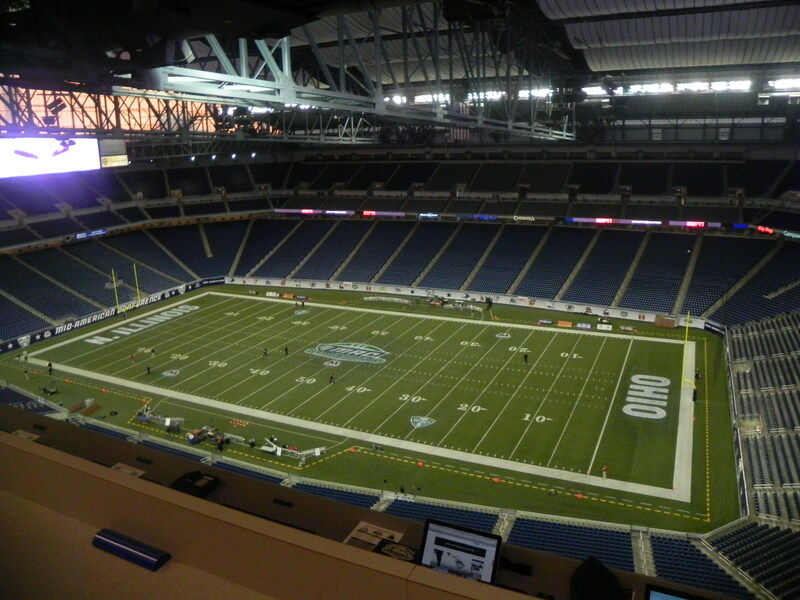 9:15- A sickly feeling coming over the green-and-white clad at Ford Field. A quick three-and-out gives NIU a chance to really make noise late in the 3rd. 9:21- Ohio defense steps up big time making tackles when needed. Offense trying to put something together before the end of the third quarter. -NIU came out much more focused for the better part of the quarter and it showed. -Ohio didn’t try anything fancy that quarter. Didn’t hurt them, but it didn’t help them slam the door either. Just 35 yards for the offense in the 3rd. -NIU averaging just 3.6 yards per carry on the game. Mega props to the Ohio defense for containing Harnish and Co. on the ground. -LaVon did not see the ball once in the third quarter. The Huskies have taken him out of the game which helps their cause greatly. 9:33- Ohio still can’t finish. A nice drive stalls only to see Ohio come up empty handed when Weller pushes a field goal wide right. It is his first miss from inside 40 yards all year. 9:42- Jelani Wosley doing it big on defense for Ohio, coming up with a huge sack on third down with the Huskies driving. Ohio can really put a dent in this game with another time consuming drive. 9:48- Tettleton makes a really, and I mean really dumb decision throwing a deep ball into double coverage on a first down. No need to try that when running the clock out. NIU gets life yet again. Can they finally convert? 9:54- Personal fouls. Blown coverages. Ohio is coming unglued. Missed PAT keeps it a 7-point game after the NIU touchdown. 10:03- Ohio takes some time off (thanks to another offsides on fourth down) but after a shanked punt, NIU has a short field with 4:36 to work with. 10:08- Tie game. Harnish to Palmer yet again. Tied at 20 with 2:52 to play. 10:13- 1:18 remains with Ohio punting the ball back to NIU. They have a really, and I mean really good chance to win this in regulation. 10:18- NIU gets it down to the OU 19 with 37 seconds to play. Would be a 36-yarder for the win.